Rain, wind, and big surf. This isn’t your typical Canadian winter. 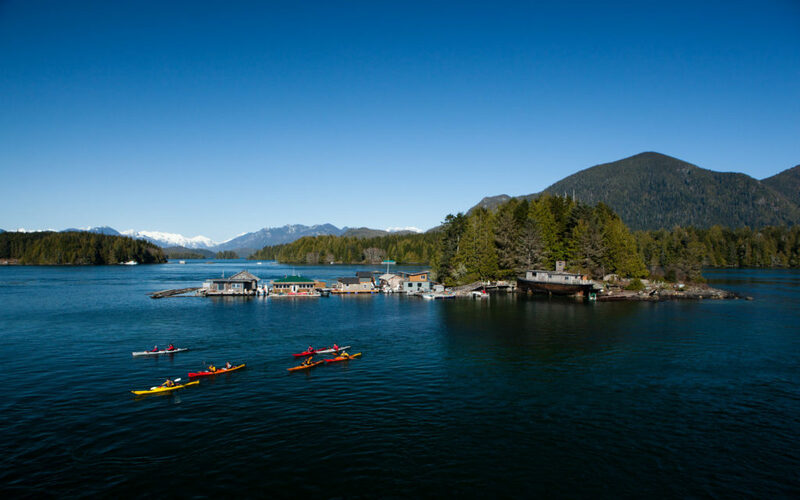 Here in the temperate coastal rainforest, the average winter temperature generally rises to around 8 degrees Celsius. Winter here means dramatic skies, rain (sometimes falling sideways), impressive swell…and bursts of sunshine. Storm watching season is as much about the weather as it is about how frequently it can change. All you have to do is be present to witness it. 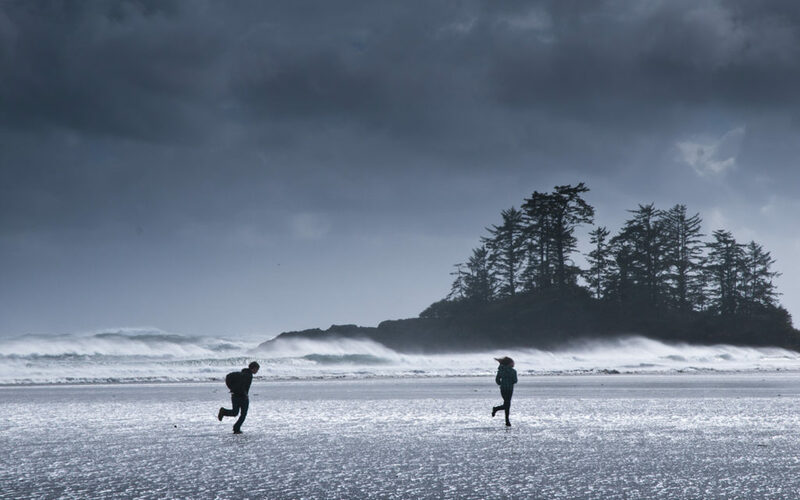 What makes Tofino such a storm watching hot spot? One factor is our exposed coast, with no landmass between here and Japan. 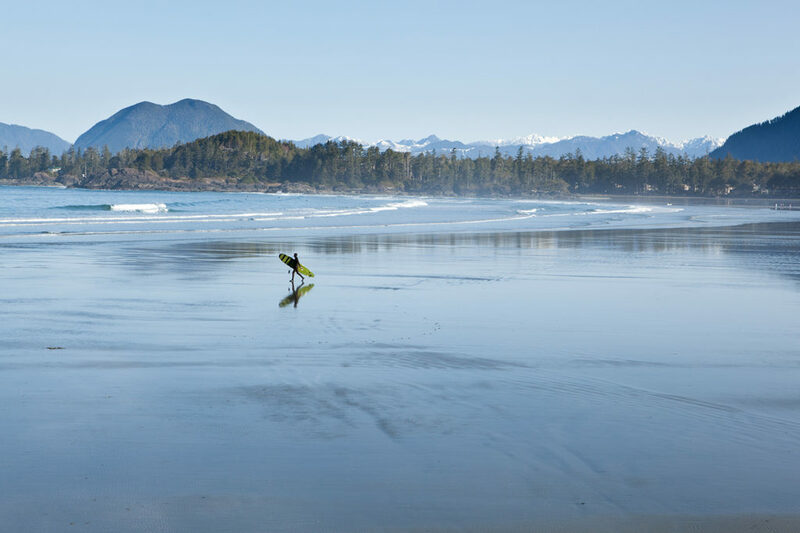 This places Tofino in the unique position of experiencing the wind that builds up over distance, giving us those beautifully bent krummholz-shaped trees along the coast and waves that will roll in at up to 20 feet in height. Despite our water temperature getting no warmer than 15 degrees Celsius, the ocean releases heat and moisture. This moderates the temperature on our coast, keeping most of our winter days snowless. The interaction of this warm ocean air with the colder upper air masses “energizes” the lows. Our storms generally originate in the Aleutian Low, situated by the Aleutian Islands in the Bering Sea by Alaska. As this low intensifies, what we get is rapidly falling pressures and strengthening winds. Add to that some intense rainfall, and you’ve got Tofino winter storm watching conditions. Lean into the wind at Chesterman Beach. 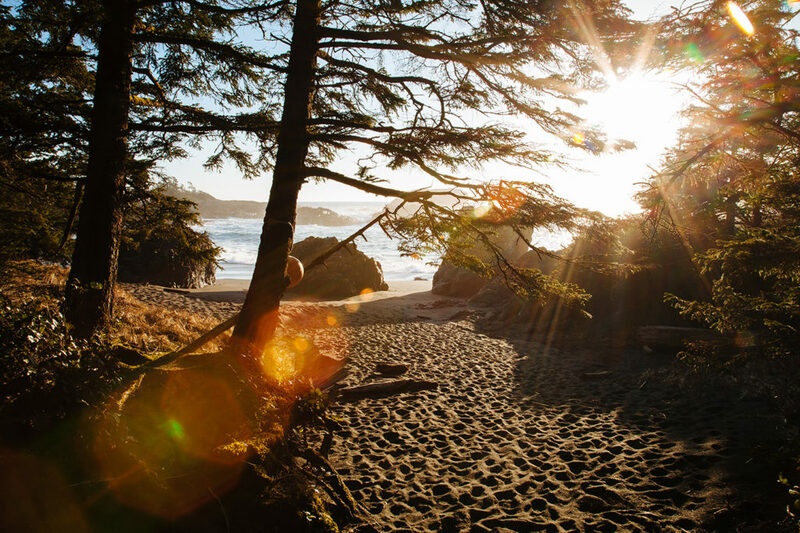 This is the beach where it all began, when the McDiarmid family enjoyed storm watching so much that they built the Wickaninnish Inn in 1996 with the confidence that others may want to storm watch, too. And they still do, especially from the 270 degree perspective of the beach and ocean at The Pointe Restaurant. A little further south, Cox Bay Beach is known to see the biggest waves. Take in the storm outside, or in comforting warmth with some food and beverage in The Great Room at Long Beach Lodge Resort. The deck of the Kwisitis Visitor Centre, within Pacific Rim National Park Reserve, overlooks the large bay of Wickaninnish Beach. The views are always spectacular and the wind is always strong. Dress in layers and take in the sea spray! And that’s just a headstart. It wouldn’t be fun if we revealed every storm watching spot, would it? Dress for success, which in this case means staying relatively dry. Sturdy gumboots, a waterproof jacket and even rainpants (they work!) will do the trick. Check the tide. It can rise fast, going right up to the foreshore. Water has incredible force and this is how those giant pieces of driftwood end up strewn across the beach. And those logs outweigh you. Avoid standing on tidal rocks. We’ve all seen great photos from this vantage point, but unless you possess superpowers and a desire to swim fully clothed in cold seas, we recommend staying well upland, beyond the reach of even the biggest rogue waves. 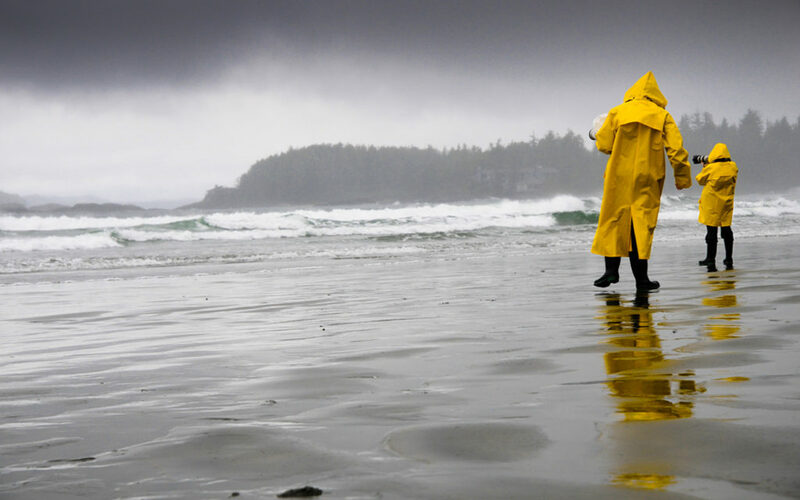 Stay dry-ish, stay safe, and enjoy your Tofino storm watching.